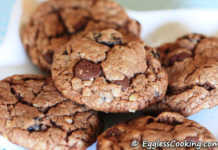 For the past few days (2 weeks to be exact) my baking experiments are not giving me favorable results. I really don’t know what happened! So I’m thinking of taking a “baking break”. 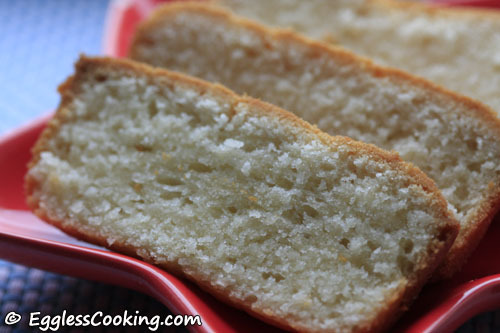 But before that a recipe for eggless pound cake. The original recipe is from “Baking for Dummies” by Emily Nolan. The only change I made was substituting silken tofu for the eggs. The cake came out soft and tasty but was very buttery/heavy. Just one piece is enough to keep you full for the next couple of hours. 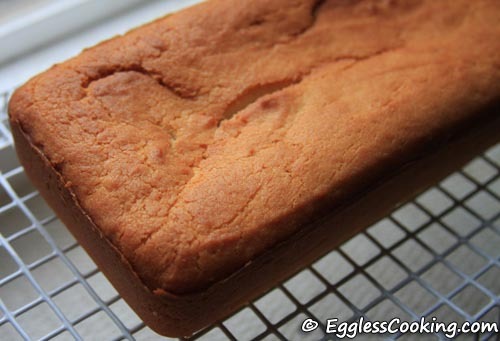 A very easy recipe to bake an eggless pound cake using silken tofu as an egg substitute. Preheat the oven to 350F/180C for 15 minutes. Grease and flour and 9×5 inch loaf pan. Cream together the butter and sugar using a hand mixer about 1 minute on medium speed. Add the milk (I used 2%) and vanilla and beat well. Add the tofu in 3 portions and mix well. Don’t beat it, just mix it with a wooden spoon. In spite of not beating the tofu, once added to the creamed butter mixture it had a curdled texture. Don’t worry. Slowly add the flour, about 1/2 cup at a time, mixing well with the mixer on low speed until just blended. Once the flour is added to the tofu mixture you don’t see any curdled tofu. The batter looks very normal and smooth. Spread the batter in the prepared loaf pan. The batter has a semi solid consistency, so it takes some time to spread it evenly. Bake for 60 minutes. When I did the toothpick test to check the doneness, mine came out clean exactly at 55 minutes. But once I cut it after cooling I found out that the center portion of the pound cake had not cooked completely. Let the cake rest at least for 10 minutes before inverting it onto a cooling rack. Transfer it to a cooling rack and it has to cool completely before you can slice it. I left mine on a cooling rack for more than 3 hours. We couldn’t taste or smell the tofu at all. The cake had the perfect amount of sweetness with a hint of vanilla flavor on the background. When the loaf comes out of the oven, it has a nice dome shape on the top, but as it cools the cake becomes flat. Don’t refrigerate the slices. Since it has a ton of butter, the cake sort of solidifies and you are not going to like the taste/texture. Even though the pound cake came out well, my vote is for the Eggless Chocolate Cake and Eggless Brownies. This is yet another entry for my event Egg Replacements – Silken Tofu..
Can we replace the butter in the recipe with extra virgin olive oil. Extra virgin oil should not be used for cooking/baking. It is only for salads and dipping. Cake tasted fine but it was wet and heavy. Not cake like. I had left a comment few days ago then i asked for your advice as to which eggless cake should i be baking(since this was my 1st time baking cake from scratch) and you referred to eggless vanilla cake with condensed milk. i followed this to the T and the cake turned out well 🙂 and it tasted good. But I have 2 question. 1.Cake did not rise as much I expected, though the inside was airy and not dense. should i beat/whisk it more? or is this the right texture for this cake? 2. the cake sank a lil in the center. what do i need to do to avoid this. Now I want to try this cake, I could not find silken tofu in the stores which i usually visit. I need to look out at different stores may be. Can i replace silken tofu with ricotta cheese? I guess you overmixed the batter and that’s why the cake didn’t rise well as well as it sank quite a bit in the center. It’s either that or it must be your oven. Each oven is different and some ovens reach a particular temperature quite quickly then others. My oven usually bakes quicker than the time mentioned in a recipe. So from the next time onwards check for a doneness about 3-5 minutes earlier. Regarding using ricotta cheese in this recipe, I really don’t have an idea how it will work. But I do remember somebody commenting that they replaced tofu with ricotta cheese in the Blueberry Pound Cake recipe and it turned out great. So maybe you should give it a try. Finally found my comments, seems like was looking in other posts. Thanks for your replies. I forgot to mention that i dint have vinegar on hand, so i used 3tbsp lemon juice after seeing your reply to one of the similar querry. Could this be the reason for sink? Also i have another querry, I dont use cake tin to bake. I use round corningware oven proof dish. approximately it is 6inch in diameter. do i need to vary the temp or the baking time? Using lemon juice instead of vinegar doesn’t matter. Either high temperature or over mixing the batter or constantly opening the oven to check if the cake is done or maybe too much liquid are some of the reasons why cakes sink in the middle. The baking time does vary according to the size of the pan you use. Wider the pan lesser the baking time. For this particular recipe I would check for doneness around 35-40 minutes itself if you use the pan you have mentioned. I was thinking of replacing the silken tofu with applesauce, do you have a recommendation on how much apple sauch instead of the silken tofu can be used? I just made your pound cake – enjoyed the process! I was caught unawares though when I realized I didn’t have a sifter, so I just “hand” sifted it. Everything worked out fine. I love the silken tofu substitute – I just recommend putting a separate step down where you tell others how to puree silken tofu, instead of just saying it in the ingredients. I substituted brown sugar, and put in just a little less than the normal sugar amount because it’s so packed. As for the vegan question – just use soy milk. Both substitutes worked out perfectly! I like my edges a bit crisp so I left it in for the full hour. It’s sitting on my countertop right now cooling and my family and I are salivating. Thanks for the great recipes! I plan to use your zuchini chocolate bread recipe next week! You’re welcome. I’ll write about tofu. Hello..I just made this cake…with slight changes..added 1/2cup tofu and 1/2 yogurt and reduced the butter to 1 stick and baked it for 65 mts.. However the cake was great..the only issue was that the crust was a li’l crisper than usual..but i think it added to the charm.. Thanks Meenakshi. I think if you had taken it a bit earlier the crust wouldn’t have been so crispy. but I find it makes our recipes bland so we are experimenting with “bumping up” spices etc. I hope soy milk will sub well as well as her “butter”. Hi Melanie, I haven’t mentioned that this recipe is vegan. It’s just egg free. 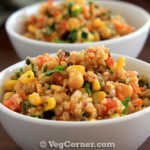 Do try this recipe with a combination of tofu and soy yogurt and I think you will like it. 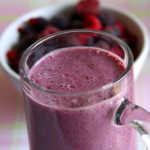 I came across your website and like your recipes – very detailed with lessons learnt :-). Now I am frequent visitor. I like the texture of the pound cake. I would like to make this vegan. Please let me know the ingredients to replace butter. I look forward to hear from you. You’re welcome Sunitha. If you want to make it vegan I would suggest using vegan margarine like Earth Balance. Also instead of going with 3/4th cup of pureed tofu, why don’t you try 1/2 cup tofu and 1/4 soy yogurt because as I have mentioned in a couple of previous comments this pound cake with only tofu was very heavy and dense. dear madhuji,what is silken tofu?can i use soya bean curd tofu?can i use this in the place of silken tofu.thank u. Soybean curd and tofu are 2 different names of the same thing like yogurt and curd. So look for silken/soft soybean curd. as per our email, I tried this recipe with 1/2cup silken tofu and 1/4 cup yogurt. It turned out really really nice. A small piece was rich, but the cake was just right, not too dense. It did taste buttery though, but no complains. Also, I baked it for about 40 minutes, because the toothpick test came out clean. Thank you very very much, madhuram:) This recipe is definitely a keeper..
Oh! thank you so much Ratna for taking the risk of trying out what I had mentioned. I really appreciate it. Now I can’t wait to try this combo. Yes it was buttery but that’s what is the specialty of pound cakes! Is’nt it! I tried making a simple vanilla cake using silken tofu and it turned out great ! !I made it in the shape of a butterfly for my daughter’s 2nd B’Day and used unsalted butter and sugar as frosting ..Thanks for the healthy and easy recipe. Thanks for trying the recipe Poorvi. Any idea why this can happen? Am planning to try the same recipe with tofu next time. Jayanthi, pound cakes and quick breads tend to crumble if cut when it is even mildly hot. It has to cool completely. It is better to cut it after cooling it between 12-24 hours. The reason could also be the sour cream, because sc and yogurt tends to give baked goods a lighter texture. So I would recommend using maybe 1/2 cup tofu and 1/4 cup sour cream because my tofu only pound cake was quite heavy and was not airy. Hope this helps. I’ve tried this recipe too. My husband and I liked it so much! I’ve tried a few other recipes too from your blog and they worked really well and really really tasty (I like the eggless choc cake the most 😉 )…. You’re most welcome and thank you so much for trying all these recipes. Have you tried baking with cherry brook kitchen cake mix. its eggless cakes mix. Very, very good. I’m happy I found your website. I do a lot of eggless baking. This is an easy & quick recipe to make. I normally sub. 1/4 cup sour cream for one egg. So for this recipe I used 3/4 cup sour cream instead of the tofu. Also some orange zest..mmmmmmmmm. I’ll be telling my friends…. Wow! I’m going to try this one definitely because mine was lightly uncooked because of the heaviness of the tofu I guess. Thank you so much Varsha. It’s good to know that it turned out good for you because I was not very thrilled with my pound cake. Maybe I cut it bit earlier and it looked slightly uncooked in the middle. Thank you once again for trying a lot of recipes from here. Thanks Samata. I too have seen recipes with condensed milk and soda instead of eggs in baking recipes. I guess they act as an egg substitute but I’m not sure as to how much condensed milk or soda has to be used to replace each egg. Maybe around 1/4 cup condensed milk for 1 egg, but not sure about the soda. Hi has any one made eggless and dairy free cake using cake mix eg duncan hines. 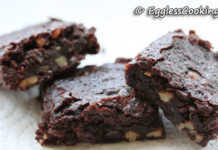 i have tried with egg substitute EnerG but my cake crumbes down, does not come out right. please help me. Asha, EnerG doesn’t work in all store bought mixes. It’s mentioned in the pack intself. Try using silken tofu. Hi madhu, I came across u’r website i have two kids both allergic to eggs, milk,nuts etc i want to bake for them i tried using EnerG egg replacer the cake does not come out good it falls apart what is the reason or what can be used please help. Asha, did you mean that you used EnerG in this pound cake recipe? If so may be there was not enough liquid/binding agent to hold the cake together. Sometimes even when the instructions in the EnerG packet mention that 1.5 teaspoons with 2 tablespoons water, the particular dough may need extra 2-3 tablespoons of liquid. Very shortly I’m going to post around 30 entries using EnerG and that includes a recipe for a pound cake, layered cake, chocolate cake from another blogger. Maybe you can try those recipes. I baked the eggless pound cake today and it came out so well. Only change that I made was to use applesauce instead of silken tofu(as per your suggestion for eggless chocolate cake) as I don’t get silken tofu here. Only problem was I could not make pieces like yours. It broke into small pieces when I treid to cut like bread loaf. I don’t know why. But the taste was so good. This is the first time I made vanilla cake without using milkmaid condensed milk, still the cake was so tasty.It got over in minutes. :-)Thanks a lot for sharing this recipe. Hi Priya, I think you should have baked it for another 5 minutes and let it cool for some more time, even overnight. Or what you can do is try baking it in a cake pan or any other flat pan for half the time mentioned in the original recipe. Thanks for trying out the recipe. 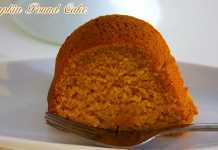 Hi Madhu, I tried pound cake with four eggs..,followed different website. Girish and I don’t mind egg, but the egg taste and smell in this cake was too much that I decided not to use egg any more. Should try your eggless version, picture looks good. Hi Shobi, how are you? If you are going to try with silken tofu bake for 3-4 minutes longer than I have mentioned. Mine was a little bit raw in the middle, even though the toothpick inserted came out clean. Or else try with soy milk. I’m thinking of trying the same recipe with EnerG egg replacer powder. i tried our POUND CAKE RECIPE… it has turned out pretty nice n buttery, but i faced 2 issues where i might need ur guidance, one is the cake half of the cake was baked well and looked grainy and the ohter half was moist and (was cooked but,,) soggy. also wen i saw it being baked it got was rising well enough and looked spongy but wen i got it off the oven n let it cool it became flat. 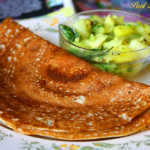 Hi Mahima, I also faced a similar problem, regarding not cooked well in the middle. That’s why I had mentioned to bake it for 60-62 minutes. Even though the toothpick came out clean after 55 minutes, I found that the centre was not baked. My pound cake also had a dome top but after sometime it became flat. I have mentioned this also in My Notes. I’m also not aware of the reason. I think tofu makes the end product very heavy. So I’m thinking of trying the same recipe with soy milk instead. 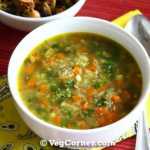 I have come across different cooking blogs and I really appreciate your honesty in that you let us know if it does not turn out good or when you did not follow the steps.. I really appreciate that! Welcome Rajshri and thank you very much. I simply want to make a point that anybody can bake and everybody make mistakes and it’s from those mistakes only we can learn.